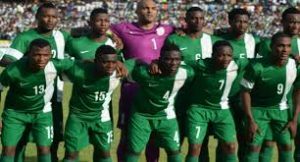 Nigeria unmoved in new FIFA Ranking – Royal Times of Nigeria. The Super Eagles moved up one place in April from 41st to 40th in world football and remained in that position in May. Super Eagles of Nigeria are unmoved in the new FIFA Ranking released on Thursday, May 4. In the new ranking, Nigeria are still fifth in Africa behind Egypt (19), Senegal (30), Cameroon (33) and Burkina Faso (35). Congo DR (41st), Tunisia (42nd) Ghana (45th) Côte d’Ivoire (48th) and Morocco (53rd) make up Africa’s top 10. In the largely unchanged table from last month, Brazil remain the number one country in the world with followed by Argentina, Germany, Chile and Colombia. France, Belgium, Portugal, Switzerland and Spain make up the top 10. (1) Egypt (2) Senegal (3) Cameroon (4) Burkina Faso (5) Nigeria (6) Conge DR (7) Tunisia (8) Ghana (9) Côte d’Ivoire (10) Morocco.